The selfie craze has come to the game. I've always taken screenshots with myself and whatever boss we happened to be fighting. The addition of the ability to take selfies will probably mean more people are positioning themselves with the boss to their back. For a brief time, their dps, tanking or healing numbers will go down, while they fumble with their selfie camera. I already put an icon on my toolbar to use right away when the selfie urge arises. Here's a recent selfie with Onyxia. If she'd just drop her mount, I'd leave her alone. Is it in your bags? Wave. Thanks for stopping by. Floor Tanking is a collaborative blog written and created by members of the Alliance guild Spectacular Death on Llane. 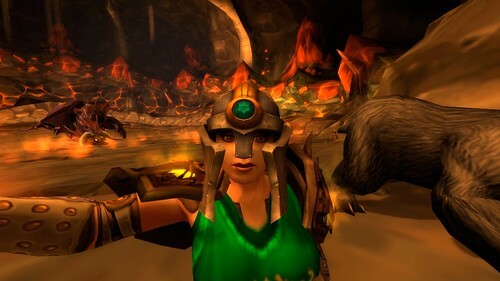 Formed in December of 2007, the guild's focus is on total WOW content in a casual atmosphere.